Note: Article 11 of almost all the DTAAs contain definition of the term ‘interest’ and hence the definition under the Indian Domestic law may not be the guide where there is DTAA. A.2. Income deemed to accrue or arise in India. Note: interest payable by Indian resident to a non-resident for using the funds in business carried on outside India shall be non-taxable in India. So, Indian companies borrowing funds from foreign banks for using such funds in projects carried on outside India, interest payable thereon shall not be taxable in India. any income of a business trust by way of interest received or receivable from a special purpose vehicle. “Business Trust” has been defined to mean a Trust registered as an Infrastructure Investment Trust or a Real Estate Investment Trust the units of which are required to be listed on a recognized Stock Exchange. Note: Where the interest income satisfy the conditions of section 194LC/LD/LBA, it is better to invoke the domestic tax law instead of DTAA as tax rate is lower under domestic law. Also, Interest from Indian co. for money borrowed in INR is taxable at 40%. Further Interest from NR for its business / PE in India is taxable at 40% subject to applicable deductions and allowances. Article 11 of DTAAs is divided into six paragraphs. Paragraph 1 provides the right of taxation of interest to the state of residence of the lender. Paragraph 2 gives the restricted right to the source state to tax the interest at a fixed percentage of the gross amount. Paragraph 3 defines the expression interest. Paragraph 4,5 and 6 brings about the exceptional scenarios such as where interest paid has a relation with the permanent establishment or a fixed base and where the interest is not negotiated at arm’s length price in case where a special relationship prevails. As per Article 11(3) interest means income from debt-claims of every kind, whether or not secured by mortgage and whether or not carrying a right to participate in the debtors’ profits and in particular, income from government securities and income bonds or debentures, including premiums and prizes attaching to such securities, bonds or debentures. However, this article specifically excludes the penalty charges for late payment from the purview of interest. DTAAs generally provide the maximum rate of taxation. The rate of taxation ranges from 10% to 15%. However, DTAAs with Greece, Libya, Mauritius, Egypt leave the rate of tax to be determined as per domestic laws. The issue with respect to payment of interest by branch/permanent establishment (PE) to its foreign bank/head office (HO), by the Indian PE to its HO was twofold, i.e. firstly, whether the interest paid by the Indian PE to its HO was liable to be taxed in the hands of the HO in India and whether such payment of interest would be deductible in the hands of the Indian PE. This controversy was decided by the Special Bench of the Mumbai Tribunal in case of Sumitomo Mitsui Banking Corporation wherein the Mumbai ITAT held :Indian PE and the HO along with its other branches are the same legal entity and one cannot make profit out of self. Hence, interest paid by the Indian PE to the HO are neither taxable as income nor tax deductible as expenditure under the domestic tax law of India. However, where the concerned tax treaty treated the PE and HO as separate entities and there existed specific provisions that enabled Indian PE to claim tax deduction of interest paid by Indian PE to HO. Hence, a deduction under the tax treaty was allowed. Nevertheless, there being no specific provision either under the domestic law or the tax treaty to charge to tax the interest being paid by the Indian PE to the HO, no such tax can be levied in India. Position w.e.f 1.4.2015: The Finance Minister, with an intention to provide certainty, as indicated in the Memorandum to the Finance Bill, 2015, on this aspect has proposed to amend the Act to provide that, in the case of a non-resident assessee, engaged in the business of banking, any interest payable by the Indian PE to the HO or any PE or any other part of such assessee entity outside India shall be deemed to accrue or arise in India and would be chargeable to tax in addition to any income attributable to the Indian PE in India. The PE in India shall be deemed to be a person separate and independent of the non-resident assessee. Accordingly, the Indian PE shall be obligated to deduct tax at source on any interest payable either to the HO or any other branch or PE, etc. of the entity outside India. This amendment has been proposed to be brought out under section 9(1)(v) of the Income-tax Act, 1961 (the Act) by way of an Explanation and is proposed to be made applicable from the assessment year 2016-17.
a) Thin Capitalisation: Since interest unlike dividends, is generally allowed to be deducted from the company’s profit before corporation tax and since moreover, taxation of interest in the state of source is more beneficial than that of dividends, it is likely that company will prefer borrowings from shareholders’ to increase its shareholders’ contributions. Though many countries have passed legislation designed to prevent such devices resulting in tax avoidance and particularly envisaging that interest paid be treated as dividend in cases where there appears to be thin capitalisation or under capitalisation. India is still an exception and presents opportunity to explore such option to reduce tax outflow on dividend and pay interest instead of dividend. In India, payment of dividend is liable for additional tax@18% in addition to corporation tax @ 33% on entire income. However, interest is subject to maximum withholding tax of 20% ( 10%/15% under DTAA). However, such arrangement shall not be permissible in respect of transactions with countries which DTAAs have already a GAAR clause. Eg. DTAA with Ukraine contains anti abuse provision within Article 11- Interest itself. Also, such transaction shall not be permissible with countries like Belgium where DTAA specifically provides that Dividend also include income even paid in the form of Interest- derived from capital invested by the members of a company other than a company with share capital which is resident of Belgium. b) Credit card interest:Banks providing credit card facilities is different from debt created between lender and borrower. The service charges received from credit card holders on overdue payments is not interest on loan and thus amount due from card holders is not taxable as interest. c) Credit Guarantee fees: Guarantee fees are payments for a possible future action and thus be treated as compensation for services performed rather than interest. A common practice in this regard has been to analogize the guarantee fee payment to an interest payment. There is no current Indian jurisprudence pertaining to Credit Guarantee fees. -In the case of Container Corporation vs. Commissioner [134 T.C. No. 5 (February 17, 2010)], Vitro, Mexico Parent, did not loan money to its U.S.-based subsidiary, International. Instead, Vitro promised to pay notes issued by International in the event of a default. International paid its parent company a guaranty fee in exchange for that service. The US Subsidiary paid a guarantee fee to the Mexican Corporation and did not withhold US Income tax from the guarantee. The tax court concluded that the Guarantee fee is not interest because the Mexican parent did not make a loan to the U.S. Subsidiary and that the guarantee fees is not compensation for services because the value of the guarantee stems from the promise made, not from an applied intellectual or manual skill. 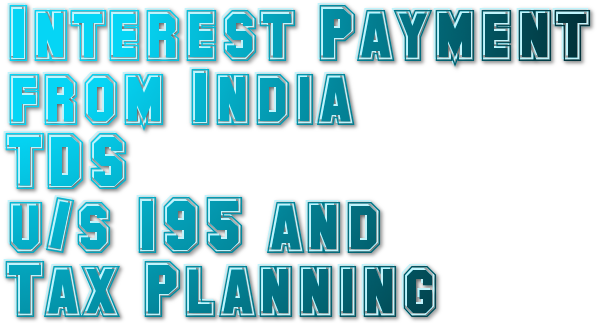 -The term interest has been defined in India to include any service fee or charge in respect of money borrowed or debt incurred. Thus, going by the definition, it can be said that the guarantee fees partakes the character of interest. However, in view of the reasoning given in Container Corporation(above) it can be argued that same is not a service fee and hence not in the nature of interest. -Also, going by the DTAAs, guarantee fees may qualify as business income under Article 7 or Other income under Article 21 but not as interest income. Hence, guarantee fees is not taxable in India as interest income. d)Loan from Banks –Taxation by the State of source is typically levied on the gross amount of the interest and therefore ignores the real amount of income derived from the transaction for which the interest is paid, is particularly important in the case of financial institutions. For instance, a bank generally finances the loan which it grants with funds lent to it and, in particular, funds accepted on deposit. Since the State of source, in determining the amount of tax payable on the interest, will usually ignore the cost of funds for the bank, the amount of tax may prevent the transaction from occurring unless the amount of that tax is borne by the debtor. For that reason, many States provide that interest paid to a financial institution such as a bank will be exempt from any tax at source. Though India allows the reduced/nil tax rate on interest paid to financial institution but such reduction is subject to approval by central government. -Hence, where loan is proposed to be taken from above mentioned countries, it would be better if loan is sourced directly from foreign banks to avail lower rate of taxation and hence reduced cost of borrowing. Such loan may be guaranteed by foreign holding company for which guarantee fees may be paid which again is not taxable as interest. Interest payment and underlying taxability of same is an area of extensive tax planning. However, these are to be determined on the basis of facts of each case. I hope the article will be useful in your professional endeavors.